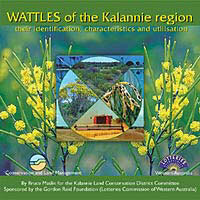 The Kalannie region includes the combined Kalannie, Goodlands and Jibberding Land Conservation Districts. It is located within both the Dalwallinu and Koorda Shires in the north-central wheatbelt zone of south-west Western Australia. This database, contained on a CD, provides an electronic means of easily identifying the 70 taxa of Acacia that occur in the Kalannie region and to access relevant information about them. This information is intended to facilitate the use of Acacia in landscape amelioration and nature conservation programs within the area. This database includes a powerful interactive multi-access key (LucID) which allows users to quickly and accurately name species and to select suitable species for environmental and commercial utilisation in the region. Information on the scientific name (i.e. author and place of publication), common names, characteristic features (i.e. main attributes by which the taxon can be recognised), plant description (semi-technical) and taxonomy (i.e. close relatives and, where appropriate, notes on variants and variation). Information on where the taxon occurs (its entire geographic range and its occurrence within the Kalannie region), the conditions under which it grows (including what Kalannie region Land Management Units it occurs in) and an assessment of its conservation status. Information on the suitability and uses of the taxon in revegetation, rehabilitation and other landscape amelioration programs, its germination and establishment techniques (data not available for all species) and, where relevant, an assessment of its commercial potential. Flowering and fruiting periods (including seed collection techniques) and (where data are available) other biological characteristics such as longevity, growth rates, coppicing and suckering ability, weed potential, etc. In addition, the taxa are illustrated by annotated line drawings and photographs. A distribution map is provided for each taxon. The above information can be viewed and printed with the Acacia Viewer without having to go to the LucID key. Detailed information on how to operate LucID is given within the key. A synoptic guide to using LucID is also provided in the Acacia Viewer.